If you're not into cake decorating and you don't want to hire a baker to make an elaborate cake, no worries. There are plenty of simple ways to decorate a child's birthday cake that don't involve picking up a piping bag or rolling a single piece of fondant. You can start with a homemade cake, or you can purchase a grocery store cake already frosted and piped with a border. From there, all you have to do is add some easy decorations to make the cake look terrific! There's no need to struggle as you try to pipe a birthday message on your child's cake. This set of letter candles spells out 'Happy Birthday' for you, and it's as easy as sticking the picks in the top of your cake. You can find a set just like this in the cake mix isle.at most grocery stores. Note your child's age with number candles, and then add any other festive touches you want to the top of the cake. This fancy layer cake is actually very easy to make. Add a generous layer of icing to the top of the bottom layer of cake, and then cover it with sliced strawberries. Gently lay the next layer of cake on top of the first, ice it, and arrange some strawberries on top along with the birthday candle. It will look so fancy that everyone will think you purchased it, and it will taste fantastic. Most children love sprinkles. Bake a basic cake, ice it, and smother it with candy sprinkles. You'll find a wonderful variety of sprinkles at most grocery stores, as well as craft supply stores and cake decorating supply stores. M&M-style candies are another favorite with kids. Just stick them all over the frosting for a very colorful cake. You could also use Reese's Pieces or Skittles if you prefer. Just think of your child's favorite candy and add them on. Craft stores and cake decorating supply stores usually carry an assortment of decoration picks you can stick on top of a cake. This cake has a Happy Birthday pick as well as some balloon picks. Sprinkles finish the decorations. You've probably already seen a cake decoration set similar to this one at your local grocery store. They come in various designs, including a set with letters and numbers. Since these are made of royal icing, you'll want to add them to the cake just before it's time for the party. You can buy plastic toys made especially for cake decorating to really make your child's birthday cake something special. If your grocery store doesn't carry them, you should find a very nice selection at your local party supply store. If you like, you could even use real toys like small cars, action figures and more to create a theme cake. This candy corn cake would be nice for a boy or girl who was born in autumn. The design shown here also uses fall-colored sprinkles and a Happy Birthday decoration. This cake would take about ten minutes to decorate once you have frosted it. You can find a mylar balloon on a stick wherever birthday balloons are sold. Some florists also carry them. Curling ribbon is trailed around the bottom of the cake for a border. 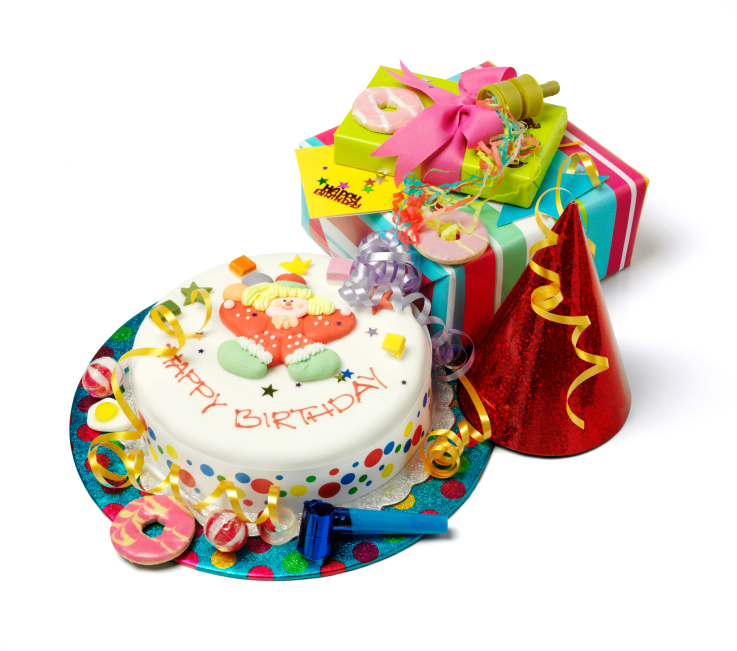 Another ribbon with Happy Birthday printed on it is wrapped around the cake. A nice topping of sprinkles completes the decorations. If you're looking for a truly easy birthday cake, nothing is easier than buying one from your local bakery or grocery store. A cake like the one pictured here can usually be purchased for less than $20.00, and the bakery can even add your child's name. Just add candles, and you're ready to sing Happy Birthday! Would you like more birthday ideas? Check out a gallery of kids' birthday cupcakes.